This Player Companion is a rapid journey through Golarion, the different heritages make you travel between continents in quick succession. The book starts with some traits which are ok, but sometimes overly specific for an usual campaign (+2 on Bluff & Diplomacy against speakers of Kelish). Dwarves and elves gain the most material, with 6 pages each. I liked the dragon hexes for dwarves, and there are several more darven weapons. Feats for dwarves are interesting and flavorful, with a focus on hammer throwing and hiding in stony terrain. Only offender here is a breath weapon for dwarves which is totally overpriced for what it does. Elven martials get some love, with an alternate racial trait for being proficient with Eastern weapons and... a Dex based samurai archetype! This variant is probably the best part of the book, replacing the standard juggernaut with a very mobile and still devastating warrior. Gnomes, half-elves and half-orcs get 4 pages each. There is a fey-touched template which can be used for summons and familiars (provided the character has some link to fey), basically a toned down version of the fey creature template in Bestiary 3. Half-elf heritages get a decent feat linked to each: Create a free potion each day (druid spell only, CL 1, needs natural water source, but still), fight better at low HP, be aware of invisible allies or gain haste for 1 round. The half-elf vigilante archetype is straight-forward and nice. Half-orcs gain access to a single feat, depending on heritage, too. Gain a boost to skill checks, catch your foe flat-footed in difficult terrain or get some cold resistance which stacks with any other. There are also two considerable combat focused feats, available for all half-orcs. Halflings get the short end of the stick, with just 2 pages (maybe the author didn't deliver more in time). The Segadan heritage allows to boost your allies a bit, so it's welcome for a support role. Half a page is spent on an equipment trick feat for slings. Surprisingly, ratfolk ninjas get the most part of the next page, with a focus on explosions. They can now pick up tricks to shut down magic items with daily uses or to do more damage by swarming. Even more surprisingly, merfolk and sahuagin (!) get the last page, with a few alternate racial traits and a combat style chain related to Sahuagin blood frenzy. Overall, the book comes with a lot of character options and a limited amount of flavor - as usual for current instances of this product line. There are a few gems, especially the samurai archetype, but otherwise it's rather a book for collectors than a must-have. A waste of my money and time. I was hoping for at least one archetype for each sub-race and quite a few racial feats and traits as well. Instead we get repeat traits that were in other books and so little material it's practically useless. Such a huge letdown. Oh nice! Glad to see non-human ethnicities! 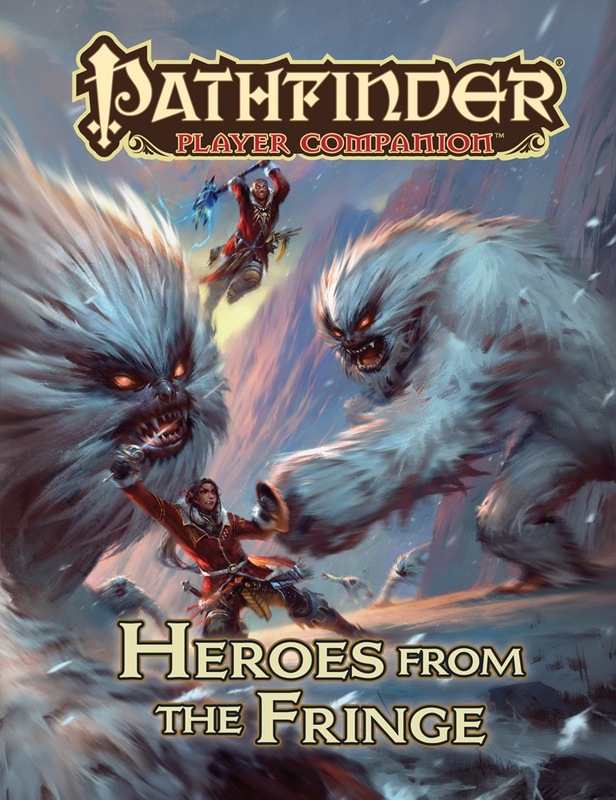 Geez, Paizo *is* running out of ideas, what kind of heroes live in a refrigerator? I read 'Heroes of the Fridge' first myself, but some love for the four nonhuman Core races (and others) is very welcome. Nifty. Looking forward to this. Very nice! Glad to see this coming. Only in the unlikely event that different Caligni ethnicities are posited to exist. I suspect that Caligni are a bit too rare to get that treatment. Finally! A book on paranormal investigators and minority political views on Golarion! Hopefully this details all the ways Lion Blades are listening to you. Fingers crossed for more on the Vishkanya. And so are the Greys! Ones with a really good hide check. Seriously i can't find anything in there. Am I the only one that got the Ron Marz joke? I am very excited about this book considering this is a topic not covered very often.I was trying to think of all the diverse racial groups,below is whati came up with. What am I missing? I am specifially not including groups that already have a book covering that group such as Half-Elves, Half-Ors, Aasimar, etc. While there are race books about Elves and Dwarves, those books have very little discussion on the diverse groups within the larger population group. This sounds real cool! I know it's Player Companion over Campaign Setting, but I'm looking forward to societal and cultural details for these groups. Thought I read "Heroes of the Fridge." when I saw this thread, Ice cream Warriors on the March! Are kuru human? I thought they had entirely separate stats. They do. They come from humans though. Wow, how did I miss this one being announced. After taking a closer look at how the term subrace/variant race is defined in the Advanced Race Guide, I no longer expect to see information on Drow, Aquatic Elves, Sivrfneblin, Duergar, Fey/Original Gnome, Kuru, etc. All of those are appear to be more of a Race unto themselves instead of a subrace/variant race. So here is my attempt to identify the all the subraces/variant races mentioned in the Advanced Race Guide and other sources and what that subrace/variant race is called on Golarion. I am still excluding Half-Elves and Half-Orcs as they already have a book. 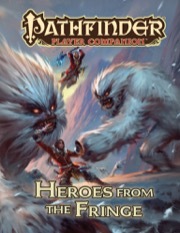 Looking at the above Subraces/Variant races I am interested in seeing Paizo examine the concept of a Subrace in greater detail. Based on the concepts of Subraces that have been identified I have attempted to try and identify what qualifies as a Subrace. So considering the above, this is all pretty interesting because it gives us some idea of when in Golarion's history some Subraces become there own Race and which current Subraces may be developing into there own Race. For example I could see the Arctic Elves and Bleachlings developing into there own Race at some point. Also, Humans seem more inclined to quickly develop into a separate Race (Kuru, Gillmen, Munavri, Azlanti) and Halflings are the least likely to branch into unique Races. Also, Elves seem the most inclined to develop Subraces, although this makes since considering the effects environment has on Elves. Looking forward to this book. I hope each Subrace gets a half page spread like the Subraces of Aasimar, Changelings, Half-Orcs, etc. Did someone say heroes from Fringe? I thought this would be entirely about making stand-up comedian characters. I wonder if any non-core races will get any love? How many pages does each race/subrace get? ... it's 7 months away. Dwarven Subraces: The rules we know so far and a little speculation. This Subrace of Dwarves have the Alternate Racial Traits of Minesight and Deep Warrior, with spellcasters often having the Alternate Racial Trait of Stonesinger. Speculation: These Alternate Racial Traits may more closely reflect the Racial Traits of the Dwarven Race prior to the Quest for Sky. This Subrace of Dwarves live atop high mountain peaks. They have the Alternate Racial Trait of Mountaineer. They also typically have the Alternate Racial Traits of Surface Survivalist, Sky Sentinel, and Xenophobic. Speculation: This is a relatively new Subrace of Dwarves. Although only the Alternate Racial Trait of Mountaineer is common across this Subrace the other three Alternate Racial Traits (Surface Survivalist, Sky Sentinel, Xenophobic) associated with this Subrace will also become common across the Subrace cementing them as a uniquely separate Subrace. These Dwaves have a strong dislike for magic and Elves. This Subrace race of Dwarves have the Alternate Racial Traits of Ancient Enmity, Lorekeeper, and either Magic Resistant or Stubborn. Speculation: This an old Subrace of Dwarves that have a particular hatred of magic and Elves, especially Drow. These Dwarves likely had early interactions with those Elves who fled into the Darklands to escape Earthfall. Those interactions did not go well. These Dwarves have been pushed from their homelands, typically by some outside force. This Subrace of Dwarves have the Alternate Racial Traits of Relentless and Stubborn. If dragons had some part in there exodus they also often have the Alternate Racial Trait of Wyrmscourged. Speculation: These Dwarves are more likely to be encountered in Human cities near the homeland from which they were exiled. The area of a city occupied by these close knit Dwarven communities are often nicknamed “Dwarftown” by the local population. Elven Subraces: The rules we know so far and a little speculation. No Alternate Racial Traits have been specifically identified for this Subrace. Although, the Alternate Racial Traits for this Subrace have not be identified the Alternate Racial Traits of Human-Raised and Ageless Patience may be shared across this Subrace. Speculation: The Forlorn have been discussed in some detail so no need to speculate. Note: The Human-Raised Alternate Racial Trait does not specifically mean the Elf was raised by Human but is more generally meant that the Elf was raised by one of the shorter lived races. No Alternate Racial Traits have been specifically identified for this Subrace, however, the text for the Alternate Racial Trait of Ageless Patience does specifically identify Jinin Elves. Speculation: The Jinin Elves have been discussed in some detail so no need to speculate. This Subrace of Elves has the Alternate Racial Traits of Crossbow Training and Natural Swimmer. These Elves are from Mordant Spire and have a stronger association with the sea than most Elven communities. Speculation: The Mordant Spire Elves have been discussed in some detail so no need to speculate. Note: The Advance Race Guide presents the Alternate Racial Traits for Subraces in standardized blocks. The Alternate Racial Traits for Mordant Spire Elves are not presented in a standardized block and only offered as options. I suspect that if the Subrace rules for Mordant Spire Elves are presented in a standardized block similar to the layout in the Advance Race Guide they Alternate Racial Traits of Crossbow Training and Natural Swimmer will be integral and not optional to the Subrace. No Alternate Racial Traits have been specifically identified for this Subrace. Although, the Alternate Racial Traits for this Subrace have not be identified the Alternate Racial Traits of Desert Runner and Elemental Resistance (Fire) may be shared across this Subrace. Speculation: These Elves have become attuned to the dry, hot, and harsh environments of the desert. No Alternate Racial Traits have been specifically identified for this Subrace. These Elves have become attuned to life in the Jungles of Golarion. Speculation: We know form the Trait Ekujae Reflexes that these Elves have quick reflexes. This Subrace may share the Fleet-Footed Alternate Racial Trait. This Elven Subrace has the Alternate Racial Traits of Eternal Grudge and Fleet Footed. These Elves have a strong hatred of Dwarves and Orcs. Speculation: These Elves came into direct conflict with Orcs and Dwarves as those two races pushed to the surface of Golarion during the Dwarven Quest for Sky. No Alternate Racial Traits have been specifically identified for this Subrace. Speculation: This Subrace may share the Elemental Resistance Alternate Racial Trait. This may not be a Subrace of Elves as there is little indication that such a Subrace exists. Arctic Elves have attuned to life in lands that are dominated by ice and snow. This Subrace has the Alternate Racial Traits of Darkvision, Desert Runner, and Elemental Resistance (Cold). This Elven Subrace is attuned to night, darkness, and dreams, they are more likely to be nocturnal than diurnal. This Subrace has the Alternate Racial Traits of Arcane Focus, Darkvision, Dreamspeaker, and Silent Hunter. Speculaiton: This Elven Subrace may have a strong connection to the Dreamlands, Black Butterfly, and/or the Occult. This Elven Subrace has the Alternate Racial Traits of Arcane Focus and Urbanite. This Elven Subrace has close ties to centers of magical learning within Elven communities. Speculation: I don’t have a good idea conceptually of how or why this Subrace has developed. Speculation: No Subrace of Fae Elves have been mentioned but considering that Elves are often influenced by their environments and the natural world, a Subrace of Elves influenced by the First World is within reason. A Subrace of Fae Elves is likely to have the Alternate Racial Traits of Fey Thoughts and Fey-Sighted and either Fey Magic or Fey Wisdom. I desperately need more Ekujae and Pahmet in my life. Gimme my Noble psuedo African Elves and Mighty vaguely Bedouin Dwarves! I wonder if the book will focus on one ethnicity for each race or will it be more then one for each one? You forgot the half-elves and half-orcs dude. I hope some non-core races get some love. Remember that this is just a 32-page player companion. If they give us something on different ethnicities of just dwarves, elves, gnomes, and halflings, that would be more than enough to fill the book. I hope geniekin get some more loving here. I'm guessing this isn't the book for them, but I can still dream. Yeah, more then likely it will be non-human core races.